Grace Church is a diverse congregation committed to a common life sustained by Worship. We bear witness to God’s love in Christ through our life together and our Service to the wider community. Within any family, each member has a role to play and each member shares the responsibilities of keeping the family going. As Paul said to the Corinthians, “Now all of you together are Christ’s body, and each one of you is a separate and necessary part of it.” This is true for every member of the Grace Church Family. There is something for everyone to be part of, and if there is something new that you want to see, there will be an opportunity to bring that forward. Below is a list of the many vibrant groups at Grace. If you have an interest in any of these groups, please contact the Church Office at 914-949-2874. Acolytes. This group of adults and children serve as attendants to the clergy during the service. Many parents serve alongside their children. Training is required and anyone from age 7 up may participate. Altar Guild. This group ensures that the clergy vestments and altar cloths are kept in pristine condition. They prepare the altar for all services, including weddings and funerals. They also manage the decoration of the altar, for high holy days such as Easter and Christmas. Angelus. The Angelus is the church newsletter. It is published 4 times per year and is also made available by email and on the church’s websites. The Angelus includes articles that are written and contributed by different parishioners. Any parishioner can submit an article and some are asked specifically to write about a topic they know about. Bible Study. This group meets weekly to read and discuss themes and books of the Bible. The class is led by the rector and meets during the “school year” of September through May/June. During Lent, Bible Study is replaced by a special Lenten series. Book Club. This group puts a reading list together each season and meets monthly to discuss the book for that month. The reading list includes books of varied genres and at the end of the season, they have a celebration lunch at a local restaurant for their final discussion. Caribbean Ministries. This committee has been working on projects to assist Episcopal and Anglican churches and programs in the Caribbean for 25 years. Their largest project is a Feeding Program that provides hot meals to students in several primary schools in Jamaica, West Indies. They also sponsor a student who attends El Hogar in Honduras. Choirs. There are three choirs at Grace Church. The Senior Choir is made up of parishioners and four section leaders, who are professional singers as well as parishioners. There are also two youth choirs – one which sings during Family Sundays – and the Cherub Choir which sings at special services, including Easter. Counters. There are four teams who count, record and deposit donations received at the English-speaking services on Sundays. Each week, a different team counts and new members of the Counters Team are always welcome and needed. Episcopal Church Women. This group unites women in worship, service, gifts and fellowship which deepens and strengthens their own spiritual lives. The ECW has a history of fundraising, from its famous Mardi Gras parties to the Easter Basket raffles. They also have coordinated a coupon drive to help military families make ends meet at the grocery store. Eucharistic Ministers. This team of parishioners have been trained and given authority to administer communion to those congregants who can no longer attend regular service (temporarily or permanently). They visit with these parishioners and help keep their connection to the parish through weekly fellowship. Friends of Music. This is a committee of parishioners who are dedicated to raising money to support the music program, helping it continue its wonderful ministry throughout the year. FX3 (families, faith and fellowship). This group of families with young children saw an opportunity to connect better with each other. They plan activities designed to encourage closer relationships inside and outside of Sunday School and church services. Knitted in Grace. A group of parishioners who knit squares and collaborate to make comfort shawls and blankets for the sick/shut-in members of the parish. Lay Readers. These individuals volunteer to read the lessons and prayers of the people each Sunday morning. Men of Grace. This intergenerational group of men focuses on individual spiritual development and youth development. Each year, they award young parishioners an award and inspirational messages of support and encouragement for their future success. They also coordinate a men’s prayer breakfast with the rector. Ushers. Teams of four or more parishioners who greet and assist visitors and congregants entering the church, facilitate certain parts of the service (collection, communion), and straighten up the church following the service. Vestry. This group of parishioners serves as a leadership team to make decisions related to the running of the church. Responsibilities are divided up into several areas including Building & Grounds, Christian Formation, Growth, Stewardship, etc. Vestry members are elected at the Annual Meeting in January of every year to 2- or 3-year terms. Welcoming Committee. This team coordinates the weekly coffee hour schedule and special hospitality events. Members are on-hand to assist the coffee hour hosts (each week a different family or team hosts coffee hour) and they also manage the supplies. One of Grace Church’s strengths over the decades has been outreach. It’s manifested in many ways, from the Servant Ministry, whose members visit our sick and shut in, to the Overseas Mission offerings, which go towards projects beyond our borders. For over 25 years, the Caribbean Ministries Committee has been one of these outreach programs. This team is made up of several members who were born in the Caribbean or have some Caribbean ancestry. But don’t worry, Caribbean heritage is not a requirement of membership! The main purpose of the committee is to assist churches within the Anglican Dioceses of the West Indies and the Episcopal Dioceses in Honduras, Panama and Belize. This assistance varies. Some years, Caribbean Ministries has provided worship materials, altar supplies and clergy vestments. Since 2012, they have contributed towards a young student’s tuition at El Hogar and in 2013, they made a contribution towards our youth’s summer mission trip to Honduras. In other years, they have contributed to agricultural efforts, educational needs and scholarships. The committee does not work alone, organizations like Food for the Poor, New York Altar Guild, CM Almy, Appleton Estates and The Bickford Foundation have been a big help. The biggest event of the year for Caribbean Ministries is the annual Dinner Cruise from Westchester down to the Statue of Liberty and back up again. This cruise is routinely sold out every year and everyone has a wonderful time. 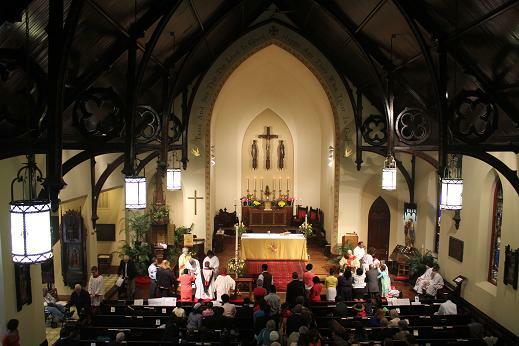 One of Caribbean Ministries’ strongest partners is St. Peter’s Church in Peekskill. St. Peter’s has collaborated with Caribbean Ministries for years on many projects and is a big reason why the dinner cruise is always such a success. This event marks the end of the committee’s largest fundraiser of the year: a raffle whose proceeds go towards a feeding program in Jamaica. Supporting the feeding program is the biggest donation that Caribbean Ministries makes. Recently, the program was able to extend its reach from nine to eleven primary schools. The schools are part of the Diocese of Jamaica & The Cayman Islands and are operated by St. Barnabas Anglican Church in St. Elizabeth. Children in these schools receive a hot, nutritious lunch and in many cases this is their best meal of the day. Over the years, funds donated for the feeding program have helped purchase large storage containers for food, supplies for starting vegetable gardens and supplies for preparing food. In addition, animals were provided to farmers who partnered with the school feeding program. There are many more things that Caribbean Ministries has done and will continue to do in the future. If you are interested in finding out about the committee, you are welcome to attend our monthly meetings which are on the first Sunday of every month. La iglesia La Gracia es una congregación diversa comprometida con una vida común sostenida por Adoración. Juntos somos testigos del amor de Dios en Cristo a través de nuestras vidas y nuestro servicio a la comunidad en general. Dentro de cualquier familia, cada miembro tiene un papel que desempeñar y cada miembro comparte las responsabilidades de mantener a la familia en movimiento. Como Pablo dijo a los Corintios: "Ahora todos ustedes juntos son el cuerpo de Cristo, y cada uno de ustedes es una parte separada y necesaria de ella." Esto es cierto para todas las personas que son miembros de la familia iglesia La Gracia. Para ser parte hay algo para todo el mundo, y si hay algo nuevo que a usted le gustaría ver, habrá una oportunidad para que lo presente. A continuación se muestra una lista de los muchos grupos vibrantes de La Gracia. Si tiene interés en alguno de estos grupos, por favor comuníquese con la oficina de la iglesia al 914-949-2874. Acólitos/as. Este grupo de personas adultas y niños/as sirven como asistentes a los/as clérigos/as durante la misa. Muchos padres y madres realizan esta tarea con sus hijos/as. Se requiere capacitación y cualquiera con 7 años de edad en adelante puede participar. Ministerio del Altar. Este grupo garantiza que las vestimentas del clero y los manteles del altar se conservan en perfecto estado. Preparan el altar para todas las misas, incluyendo bodas y funerales. También se encargan de la decoración del altar, para aquellos días especiales tales como Pascua y Navidad o recordatorios de Santos/as. Ángelus. El Angelus es el boletín de la iglesia. Se publica 4 veces al año y también está disponible por correo electrónico y en los sitios web de la iglesia. El Angelus incluye artículos que se escriben y contribuyeron por diferentes feligreses. Cualquier feligrés puede presentar un artículo y a algunas personas se le pidió específicamente escribir sobre un tema en particular que dominan. Estudios Bíblicos. Este grupo se reúne todos los viernes a las 7:30pm para leer y discutir temas y libros de la Biblia. Durante la Cuaresma, se sustituyen los estudios bíblicos por una serie especial de Cuaresma. Club del libro. Este grupo pone una lista de lectura junto a cada temporada y se reúne mensualmente para discutir el libro de ese mes. La lista de lectura incluye libros de variados géneros y al final de la temporada, tienen un almuerzo de celebración en un restaurante local para su discusión final. Ministerios Caribeños. Este comité ha estado trabajando en proyectos para ayudar a las iglesias episcopales y anglicanas en el Caribe por los últimos 25 años. Su proyecto más significativo es un programa de alimentación que ofrece comidas calientes a los estudiantes en varias escuelas primarias de Jamaica, Indias Occidentales. También patrocinan en Honduras, a un estudiante que asiste al centro educativo El Hogar. Coros. Hay tres coros en la iglesia de la Gracia. El Coro de adultos se compone de feligreses y cuatro líderes de sección, que son cantantes profesionales, así como los feligreses. También hay dos coros juveniles - uno que canta durante los domingos familiares - y el coro Querubín que canta en las misas especiales, incluyendo Pascua. Contadores. En la misa de español hay un grupo que cuentan las donaciones de ofrendas que se reciben en las misas de cada domingo. Necesitamos más personas para este equipo de trabajo. Grupo de Mujeres Episcopales (ECW). Este grupo une a las hermanas en la adoración, servicios, dones y comunión que profundiza y fortalece sus vidas espirituales. El ECW tiene un historial de recaudación de fondos, a partir de sus famosas fiestas desde Mardi Gras a las rifas de Canastas de Pascua. También han coordinado una unidad promocional para ayudar a las familias de militares con el fin de que puedan cada mes acceder a comestibles necesarios. Ministros de la Eucaristía. Este equipo de feligreses han sido entrenados/as y se le ha dado autoridad para administrar la comunión a los fieles que ya no pueden asistir a una misa regular (temporal o permanente). Visitan a estos/as feligreses y ayudan a mantener su conexión a la parroquia a través de la comunión semanal. Amigos de la Música. Este es un comité de feligreses que se dedican a recaudar dinero para apoyar el programa de música, ayudando a que continúe su ministerio maravilloso durante todo el año. FX3 (familias, la fe y comunión). Este grupo de familias con niños/as pequeños/a vio la oportunidad de conectar mejor con los demás. Planean actividades destinadas a fomentar relaciones más estrechas dentro y fuera de la escuela dominical y misas de la iglesia. Costura en La Gracia. Un grupo de feligreses que tejen cuadrados y colaborar para hacer frisas y mantas para las personas enfermas que son miembros de la parroquia. Los hombres de La Gracia. Este grupo intergeneracional de hombres se centra en el desarrollo espiritual individual y desarrollo juvenil. Cada año, adjudican reconocimientos a feligreses jóvenes y mensajes inspiradores de apoyo y aliento para su éxito futuro. También coordinan un desayuno de oración con el Rector. Los Ujieres. Equipos de cuatro o más feligreses que saludan y ayudan a las personas visitantes y feligreses que entran en la iglesia, facilitan ciertas partes de la misa (recogen la ofrenda, comunión) y reorganizan la iglesia después de la misa. Comité de Bienvenida. Este equipo coordina semanalmente el horario de la hora del café y eventos especiales de hospitalidad. Los/as miembros están disponibles para ayudar a las personas anfitrionas durante la hora del café (cada semana una familia diferente o equipo de anfitriones de la hora del café) y además manejan los suministros. Durante décadas una de las fortalezas de la iglesia La Gracia ha sido la divulgación de sus ministerios. Esto se manifiesta de muchas maneras, desde el Ministerio de Asistencia, cuyas personas visitan nuestros/as miembros que no pueden asistir a la iglesia debido a enfermedad u otros problemas que alteran la vida, hasta las misiones de ultramar, que van hacia proyectos más allá de nuestras fronteras. Durante más de 25 años, el Comité de Ministerios Caribeños ha sido uno de estos programas de extensión. Este equipo está formado por varios miembros que nacieron en el Caribe o de alguna manera tienen ascendencia caribeña. ¡Pero no te preocupes, el patrimonio Caribeño no es un requisito de membrecía! El objetivo principal del comité es ayudar a las iglesias dentro de las diócesis anglicanas de las Indias Occidentales y de la Diócesis Episcopal de Honduras, Panamá y Belice. Esta asistencia varía. Algunos años, los Ministerios Caribeños han proporcionado materiales de adoración, equipos de altar y las vestiduras del clero. Desde 2012, han contribuido a la matrícula de un joven estudiante en el centro educativo El Hogar y en 2013, se hizo una contribución para un viaje misionero de verano de nuestra juventud a Honduras. En otros años, han contribuido a los esfuerzos agrícolas, necesidades y becas educativas. El comité no trabaja solo, organizaciones como Comida para La Gente Pobres, Ministerio del Altar de Nueva York, CM Almy, Appleton Estates y la Fundación Bickford han sido de gran ayuda. El evento más importante del año para los Ministerios Caribeños es la travesía en crucero con una cena anual desde Westchester a la Estatua de la Libertad y de regreso. Este crucero anual por lo general vende todos los boletos y todas las personas tienen un tiempo maravilloso. Uno de los socios más fuertes del Ministerio Caribeño es la Iglesia de San Pedro en Peekskill. La iglesia San Pedro ha colaborado con los Ministerios Caribeños desde hace años en muchos proyectos y es una gran razón para que la travesía de la cena sea siempre un éxito. Este evento marca el final de la mayor recaudación de fondos de la comisión del año: una rifa cuyos ingresos van hacia un programa de alimentación en Jamaica. Apoyar al programa de alimentación es la mayor donación que los Ministerios Caribeños hacen. Recientemente, el programa fue capaz de extender su alcance de nueve a once escuelas primarias. Las escuelas son parte de la Diócesis de Jamaica y las Islas Caimán y son administradas por la Iglesia Anglicana de San Bernabé en St. Elizabeth. Los/as niños/as en estas escuelas reciben un almuerzo nutritivo caliente y en muchos casos esto es su mejor comida del día. Con los años, los fondos donados por el programa de alimentación han ayudado a adquirir grandes contenedores de almacenamiento de alimentos, equipos para el inicio de jardines y materiales vegetales para la preparación de alimentos. Además, animales fueron proporcionados a los agricultores que se asociaron con el programa de alimentación escolar. Hay muchas más cosas que los Ministerios Caribeños han hecho y seguirán haciendo en el futuro. Si usted está interesado/a en saber más sobre el comité, le invitamos a asistir a nuestras reuniones mensuales, que son el primer domingo de cada mes.